Founded in 1893, Flowerdale Estate is a beautiful wedding ceremony and reception venue, hidden on the north of Melbourne. Located about 100km away from Melbourne CBD, this venue can cater 180 guests for a sit-down dinner in the unique Pavilion. The North Lawn Garden with the stunning white rose and immaculate hedges is a perfect outdoor wedding ceremony place. The lakeside water glistening, the native plants, the gum trees and the rolling hills from far are the perfect backdrop. The tennis court with the cover is the backup option when you consider a bit sporty wedding or the weather turn wet. The white Tiffany chair, red carpet or rustic timber bench will make sure the magical moment of your big day is perfect. Staying at Flowerdale to get ready, get married and get sleepover is another great option they offer. Without travelling from locations to locations on your wedding day, you are definitely more stress-free and your big day could be run more seamlessly. Flowerdale is also a perfect venue for candid and natural wedding photography. The historic architectural buildings, the surrounded hills and the manicured gardens are the perfect locations for your wedding photographer to be creative. 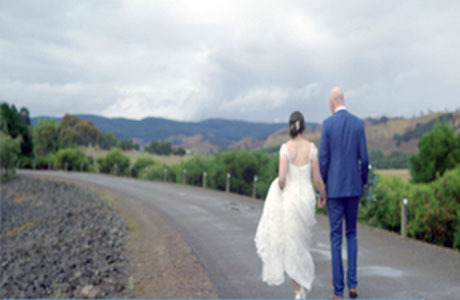 As a Melbourne wedding photographer, Flowerdale Estate is a wedding reception venue for rustic and candid weddings. Should you have any questions to plan a wedding at Flowerdale Estate, please do not hesitate to Contact Us for the suggestions and information from a wedding photographer’s view.